For me as there is no better way to start out the year for my business with an opportunity to attend the annual “First Friday” Economic Outlook Forum sponsored by the Maryland Bankers Association. This year was no exception, as I received an invitation from my long-time friend and First United Bank Market President for Frederick County, Gordon Cooley. A home-grown banking leader, Gordon’s career has spanned several decades as a banking executive and general counsel to a number of financial institutions beginning with Frederick’s Farmers & Mechanics Bank and its successors. He is also a former Commissioner of Financial Regulation for the state of Maryland. Impressive! This year’s event was the 12th consecutive forum that the association has underwritten, and I have had the honor to attend several in the past … many of which have been featured in this blog over the years. Each year a variety of distinguished economists from around the country are invited to provide their insight in the mystical arena of forecasting the financial future for business and the consumer. This year was no different with another impressive gathering. To bring a high level of levity to what can often be a boring topic, the moderator of the event was the very well-known Anirban Basu, Chairman & CEO of the Sage Policy Group, Inc., from Baltimore. James Glassman, Managing Director of JPMorgan Chase and Head Economist for Chase Commercial Banking. Mark McGlone, Chief Investment Officer of PNC Asset Management Group. Luke Tilley, a member of Wilmington Trust’s Investment Committee. Tom Barkin, President and CEO of the Federal Reverse Bank of Richmond. Wesley McMullan, President and CEO of Federal Home Loan Bank of Atlanta. Ninety-eight consecutive positive months … with December 2018 showing a high of 312,000 net new jobs, bringing the total for the year to 2.64 million. After losing over 8.5 million jobs between 2008 and 2009, the total number of net new jobs created in the US since 2010 has exceeded 20.5 million. While job creation will continue, some economists sense that the pace may fall closer to the average of that 9-year period at 2.2 million. The number of job openings continue to grow. Basu states that even with unemployment sitting at 3.9% in December, there are still about seven jobs available for every unemployed worker who is seeking a job. And while the national minimum wage is $7.50 per hour, pacesetter Amazon made it clear last year that its national minimum wage is $15.00 per hour. Despite that, economists don’t expect that much of an imbalance in the forces of supply and demand, and wages are expected to increase at an comfortable average of around 3% next year. As stated in his projections last year, Glassman believes that the speed of new technological advances in certain labor sectors will continue to replace the human labor force over the years to come, which will be offset by new high-tech job opportunities. On a side note, in case you missed the CBS 60 Minutes segment on the coming trends in artificial intelligence last week, and the impact it will have on the job market in the decades to come, look for a book by Kai-Fu Lee entitled AI Superpowers – China, Silicon Valley, and the New World Order. Fascinating! Despite the President’s Trumpeting of dissatisfaction with Chairman Jerome Powell, the panel members were confident that the Fed’s policy of adjusting interest rates has been working very well to keep inflation at a very acceptable 2% annual rate. Forecasters expect a slowdown in the number of rate moves throughout the rest of the year – maybe two times, and by the end of 2019 that figure could bump up to 2.3%. Bank prime rate could settle in around 6%. With recessionary concerns rising for mid-late 2020 and a softening housing market, it is reasonable to see long term rates may bounce a bit, but likely end up where they are now around 3%. The forecasters at Kiplinger expect those less optimistic investors to turn more to treasury purchases in 2019. There do not appear to be in overheated segments of the economy. For instance, in the last 100 years, there have been bubbles that burst causing varying degrees of recessions and depressions from overheating in the stock market, housing and commercial real estate, to name a few. While there are always any number of “micro-bubbles” in all market sectors that are growing and often bursting, typically a strong growing economy can absorb the movement of investment dollars from one opportunity to the next as they wax and wane. 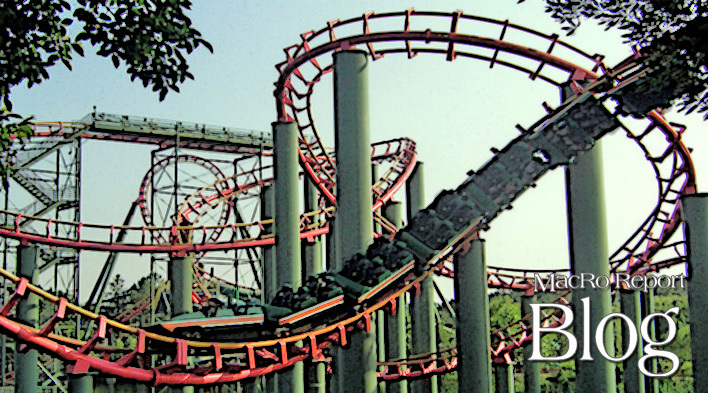 This was very evident as the tremendous volatility in the stock market took liquid investment dollars on a ride wilder than any roller coaster in King Dominion – the Anaconda 325, the Dominator or even the Volcano: The Blast Coaster! It is expected that the single-family housing market will continue to experience a problem with over supply and weaker demand due to increased mortgage rates and what some call the “Millennial Factor” where that generation is finding it hard to make commitments and start families. Could this be a recessionary trigger? Panelist McGlone sees the matter as more of a product and regional problem, as builders adapt their product to changing demographics and follow markets where job opportunities are the strongest. All confidence indexes have shown strong levels of confidence, despite all the issues that are constantly blasted out by the media. It is expected that while these levels may fall off a bit in 2019, the panelists believe that with the country operating at what is considered full employment, the consumer lead economy will likely continue at a very acceptable pace throughout the year. As for the economist confidence factor, the Harriett Torrey of The Wall Street Journal recently reported: “On average, economists surveyed in the past week as part of the … Journal’s monthly poll said there was a 25% chance of a recession in the next year, the highest level since October 2011. The probability was just 13% a year ago.” When asked about 2020, the same group rated the probability at 56.6%. In case you haven’t been paying attention, the newly elected Democratic Congress is amped up about really nailing President Trump with something (as if he hasn’t asked for it!) which now includes the longest government shutdown in history. How long will it take before a prolonged shutdown will pull the economy off its track? Hard to say, but with the number of job opportunities available in the private sector, several forecasters believe that if they want to, many of these furloughed workers will not have trouble picking up extra work to cover for those paychecks that are being deferred. And what about Trump’s tariff war with China? In general, the panelists believed that the concept of reigning in on the trade imbalance with China was a good thing, but if the tariff battle wages well into this year, the negative impact on the US economy will likely be painful. In both cases, the panelists stated that there is a high probability that the powers to be will all come to their senses before the situation gets to such dire straits that the entire economy takes one of those roller coaster rides. We can only hope! In summary, the one very consistent theme I come away with each time I attend any economic forum is that no matter who the distinguished speakers are, it is a sure bet that you’ll get a great recap on what happened last year, and a prediction that the coming year will be pretty much the same as the previous one. But when you look out eighteen months, the forecast gets cloudier with a strong prediction that things could change for better or worse. So, if you think things are pretty good now, make hay while your sun is shining, because half way through next year that hayride may be a roller coaster ride!